What would happen if you knew exactly what kind of experience each of your customers expects – and you could deliver on those expectations in a very personalized, emotionally connected way? 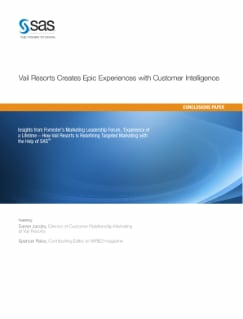 Vail Resorts is finding out, with help from SAS® Customer Intelligence solutions. By redefining marketing and striving to give each of its customers the "experience of a lifetime," Vail Resorts has achieved "priceless" results. Vail Resorts shares its story in this paper that's based on a session from Forrester's Marketing Leadership Forum.